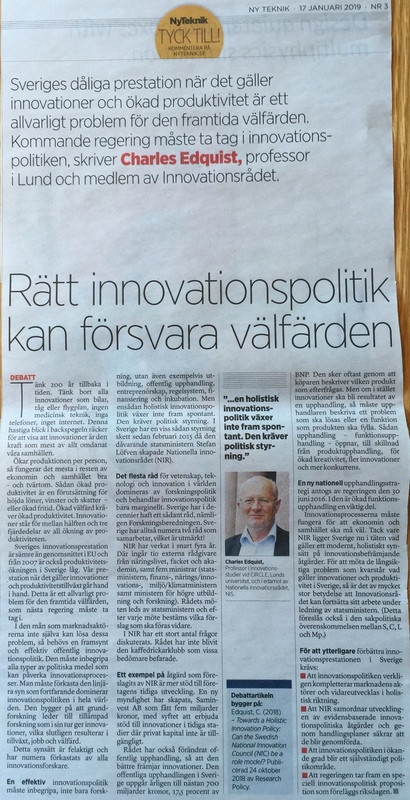 A debate article entitled Rätt innovationspolitik kan försvara välfärden. (“The right innovation policy can defend welfare” – in Swedish.) by Charles was published in the newspaper Ny Teknik on January 16, 2019. The topic is the close relation between innovation performance and productivity growth and how an holistic innovation policy can improve both and thereby contribute to higher wages, profits and taxes – or increased leisure time. Link to newspaper version. Link to Internet version, with references included.